The Tabernacle of Unity, The latest volume of Baha’u’llah’s writings to be translated and published by the Baha’i World Centre, is now available on-line. The 28 page book contains five letters written by Baha’u’llah to individuals of Zoroastrian background in the 1800s. 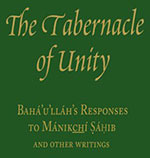 The full book can be read on-line here, or downloaded in PDF or Microsoft Word format from this page of the Baha’i Reference Library. The Baha’i Reference Library is an excellent resource for reading, searching through and downloading Baha’i literature in English, Arabic and Farsi. Two other great resources for reading and searching through the Baha’i Writings are Ocean and BahaiResearch.com. Ocean is a tool that can be downloaded and used off-line to search through the texts of all the main religions, it also includes many books written about the Central Figures of the Faith (Baha’u’llah, The Bab, ‘Abdu’l-Baha) and it’s history. Ocean enables you to save your own compilations to disk for later use. BahaiResearch.com is an on-line project based on Ocean, allowing for a comprehensive search of sacred texts without downloading any software. Both resources are available in a number of different languages. Another site that allows searching through the Baha’i Writings online is True Seeker, this is more limited in features but, due to its simplicity, will work on systems where BahaiResearch.com might fail. At the time of writing this blog entry the Tabernacle of Unity is not available in the above three tools but it is likely to be available in them soon. Finally it is worth mentioning that several Baha’i books can be downloaded in mp3 audio format and listened to off-line. These are available from the audio books page of the Baha’i Study Center. Thanks for the info on this. Tabernacle of Unity is a beautiful little book. I can’t wait until the next translation comes out from the World Center.